Today's polish is Ozotic 607. My bottle is the older shaped version, but you can get a new version of this from piCture pOlish. As you can see, 607 is a pink large particle scattered holo. This one is actually quite well pigmented, which is great for quick coverage on the nail, but it also means that the opacity of the polish takes some of the holoness away. 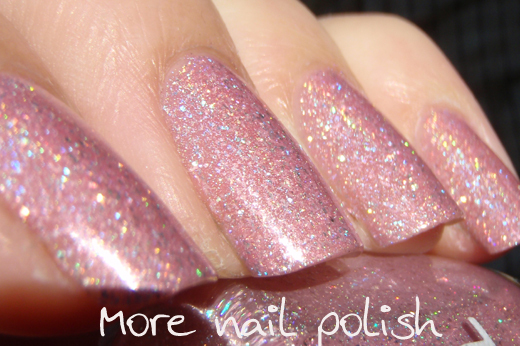 Don't get me wrong, this is still really holo-ie, just not as holo-ie as say 604. I'm up in Brisbane right now and today I found such a great display of OPI's at Price Attack in Chermside Westfield. I've never seen OPI at a Price Attack, only seen them in DJs. They had lots of older and new collections, Pirates of the Caribbean, Katy Perry, Serena Williams, Nice Stems, Shrek, Swiss, Texas, various shatter colours and a large range of current DS polishes. They were $14.95 each ($20 for the DS) which is $5 cheaper than the DJs price. I didn't buy anything though! DJs here also had lots of bottles of Chanel Peridot and Graphite. They're not stocking them in Canberra (the backwards place that it is) so it was nice to see them on display. And in case you were wondering, I have my mum at our house feeding the cats and collecting the mail. She knows to tell me immediately if the colour changing powders or spectraflair turns up. Hi Mum! Pretty! (But then every colour seems to look nice on you). This is different from Chemistry 607. That one looks like a darker, more purple toned pink. I'm on the fence about getting it. Isn't it strange that the colours don't always match up? Mel - it was a good OPI display, it was hard to leave without anything, but I did write stuff down that looked nice to come home and look up on other peoples blogs to see if there were any I really needed. Millie - Oh really, not the same as Chemistry 607. Looks like I will have to get it and see. I know my older version of Ozotic 601 is different to the new Ozotic and Chemistry 601 too. I now have both and will post a comparison soon. This color is so cute!! OMG I'm gonna have to get to Chermside. Just got my order from AU for Ozotics! I got 503, 504, 505, 506-can't wait to try them! Am a new follower! Thanks Claire - shame it's been raining the whole time! reeree - Yes, get yourself to Chermside, it's nice to see the colours in real life for once. Finger - great selection of Ozotic multichromes. You're going to love them!! Update on colour morphing powder orders. What if I mix them all together?